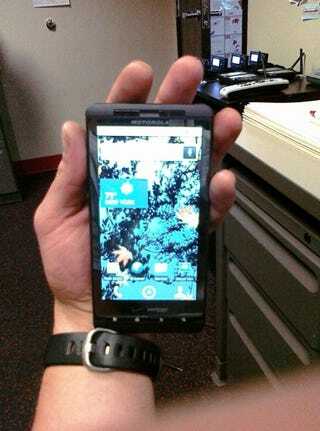 More news from camp Verizon, concerning the upcoming Motorola Droid phones. The Droid 2 Xtreme and Shadow have appeared on Verizon's inventory, according to photos sent in to Droid-Life, suggesting release is imminent. Both names have been bandied about a fair bit, with the Shadow being left in a gym only last week. Our tipster confirmed it has an 8MP camera, 4.1-inch screen, and runs Android Froyo on a Snapdragon processor. Now though, we've heard from several different sources claiming that the keyboard-less phone found in the Verizon gym (and the Verizon brochure before that), is actually the Droid Xtreme, with the Droid 2 Shadow (which has appeared on Verizon's inventory in the last few days) actually containing a keyboard and not as much internal storage—2GB, compared to the Xtreme's 16GB. It's a basic update to last November's Droid, with a slightly better keyboard, according to the rumors. Is This the Motorola Droid Shadow?